If you are going straight through a roundabout, don't signal as you come up to the roundabout, only signal left as you pass the exit before the one you wish to take. True or false? If you are going straight through a roundabout, don't signal as you come up to the roundabout, only signal left as you pass the exit before the one you wish to take. True or false? On a smaller roundabout you may not be able to give the required three seconds of indication, but you still must indicate. Roundabouts have very simple rules that many people find difficulty grasping. Approach the roundabout in the left lane, indicating left, and turn left. Approach the roundabout in any lane that has an arrow straight ahead. Don't signal as you enter the roundabout. As you pass the exit just before the one you want to take, indicate left, and leave the roundabout in the same lane as you entered it. Approach the roundabout in any lane that has a right arrow (usually only the right-hand lane if there is more than one lane). Indicate right as you approach the roundabout. Keep indicating right until you pass the exit just before the one you want to take, then indicate left. Exit the roundabout in the appropriate lane (this will sometimes be defined by road markings; other times you will exit into the right lane if it's a dual carriageway). How do complex roundabouts work? 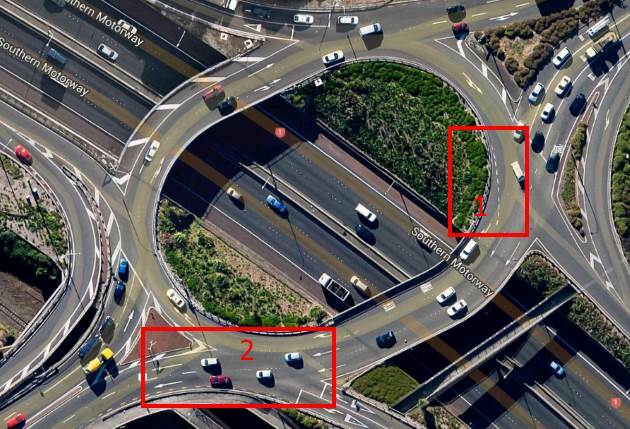 In the image below you can see the roundabout at the Greenlane motorway on-ramps and off-ramps. On the west entrance (bottom left) there is a feeder lane onto the motorway on-ramp, and two other lanes. There are two lanes at the exit to the east (top right). At the entrance to the roundabout from the east (top right) there are three lanes of which the right hand one turns right and the other two go straight ahead. There's also a feeder lane on to the motorway going south. The motorway off-ramp heading north has two lanes: one has an arrow to the right and the other an arrow to the left. There's no arrow straight on because that will take you back onto the motorway and it would be highly unusual to do that (i.e. only if you'd made a mistake, in which case you wouldn't want to confuse other drivers on the roundabout. The same applies at the off-ramp heading south at the top of the picture. Because of these off-ramps, the roundabout is only one lane wide on the east and west, but two lanes wide on the north and three lanes wide on the south. At position 1 there is a dashed line showing that the inside lane of the two lanes can split into either a third lane which will continue turning right, or the middle lane which will exit onto Greenlane towards the west. At point 2 you can see that those two lanes exit onto Greenlane to the west and vehicles stay in the respective lanes on the roundabout.